A Juicer That Makes Wheatgrass Juice and Even Cleans Itself! The Omega VRT 350 HD Juicer is a perfect addition to any kitchen and comes with state of the art features you won't find in many other juicers. One of the most important features is that it's easy to operate, no need to read step by step manuals. This juicer can fit almost anywhere in your kitchen with it's sleek and vertical design. Our favorite feature is that the Omega VRT 350 was designed with an automatic cleaning system. All you need to do is run water though the hopper when you juicing and put it away. If you have used a lower end juicer you know that they can be loud. The Omega 350 VRT is super silent to operate and even comes with reverse operation feature that prevents clogging. 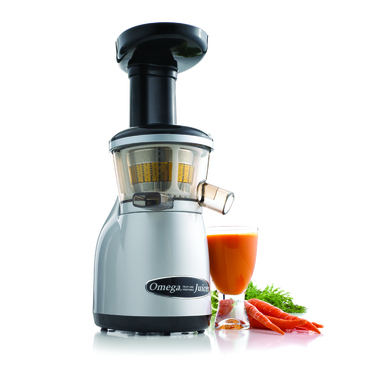 This featured rich quality Juicer comes with a full 10-year warranty and plenty of attachments for all your juicing needs, such as a feed chute pusher, cleaning brush and two screens. Slow processing retains more vitamins and nutrients for a richer juice. Fine hole strainer for those who do not like pulp. Dual phase processing leaves the pulp dry. Works with wheatgrass, leafy greens, herbs, and even soybeans. Automatic cleaning with a rinse of water between different types of produce.